Is this the face of a man who could make you a lot of money? 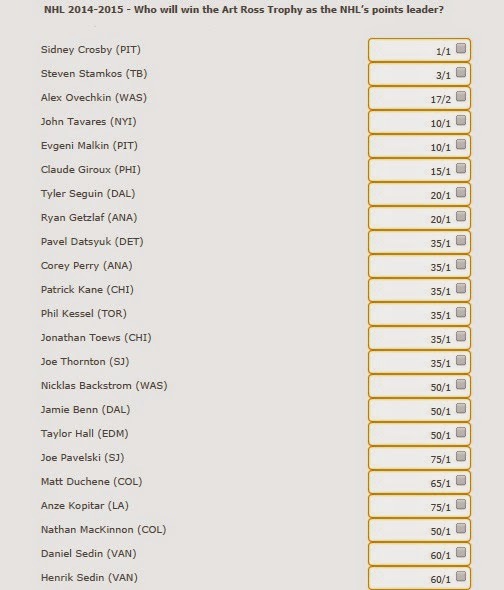 Nothing gets some friendly "what if" discussion going like player props and the talk started this week as online oddsmaker Bovada released their betting lines for who will win the major NHL awards in 2014-15. Everyone has their predictions going into a season, but once you see some of the odds next to players names it can change things. Suddenly favourites don't look worth the money where as a sleeper pick becomes mighty appetizing at 30/1. Whatever your picks, it's a sign that the puck is getting closer to dropping in October. It should be no surprise to see the last four players to win the trophy since 2009-10 as the top bets. Stamkos is the favourite and rightfully so given that he's got the highest goals/game rate in that time frame with 0.63. Ovechkin still has plenty of goals in him with 203 goals in his past 5 seasons, but you have to like a healthy Stamkos outpacing him over a full season. Corey Perry finds the net with Getzlaf feeding him, but has been inconsistent when it comes to stringing together 40+ goal seasons. Crosby's name is obviously in the mix and you can't help he could have one of those "hey, I haven't scored 50 goals in a few years, I think I'll do that" seasons. Since the odds were posted on Sept 23 we've already seen some odds change. People seem to like Max Pacioretty potting some goals this season as he's climbed from 15/1 to 12/1, whereas Tavares, Seguin, and Parise have all dipped a bit. 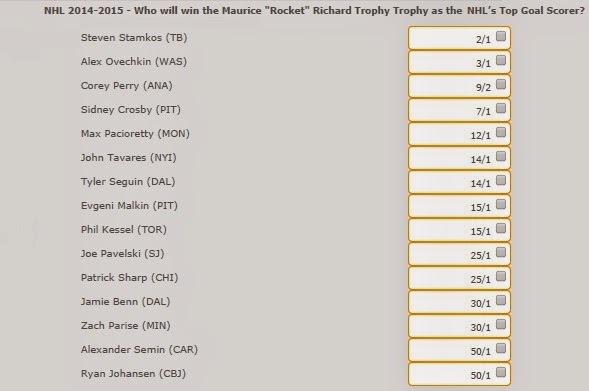 It's hard not to love the value on Seguin and Tavares at 14/1 and not many people would be surprised if either guy challenged for the Maurice Richard Trophy. If Phil Kessel got away from Tyler Bozak we might sprinkle some cash on him at 15/1 and even Malkin at the same odds makes you giddy if he's lined up next to Crosby. Outside of those eight studs we'd be shocked if anyone else won this award. Benn won't outscore Seguin, Pavelski should regress and we really don't know why Ryan Johansen is even on this list. Predicting the Calder before the season even starts is full of risk, but definitely fun to talk about. It's best to sit on this one until last call so you know your bet has actually made the team, but if you want the best odds you gamble now. Drouin will miss all of training camp and some of the the regular season with a broken thumb, but you have to like him as the favourite if his rumoured linemate is Stamkos. Gibson stood on his head in the playoffs last spring, but can he perform in a full season and beat out Frederik Andersen as starter? 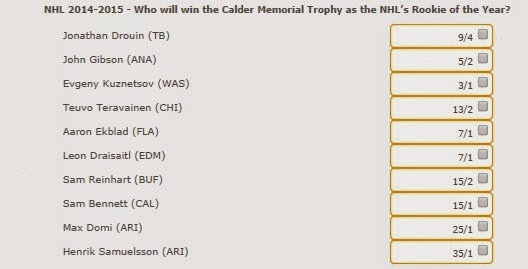 Kuznetsov is our pick for the Calder at 3/1 given that he's the oldest of the bunch at 22-years-old and has 5 years of pro hockey in the KHL under his belt. Pair him with Ovechkin and he could end up with plenty of points which usually wins you this award. Draisaitl, Reinhart, and Bennett could all have Sean Monahan-type years where they get plenty of minutes on terrible teams and put up points as long as they play. They either stay and score or end back in junior. Teravainen is in tough on a Blackhawks team with plenty of depth, where as Ekblad would have to have a Norris-worthy season to even get noticed for the Calder as a defenceman. Erik Karlsson led all d-men in scoring last season with 74 points in 82 games, good enough for a 13-point cushion on the eventual Norris winner, Duncan Keith. Unfortunately, being -15 rating doesn't help your Norris argument. Karlsson will likely lead d-men in scoring again, but he might have to be one of the top league scorers to win the Norris this season. Weber is a beast and worth a look at 11/2, where as we wouldn't gamble on an aging Zdeno Chara. 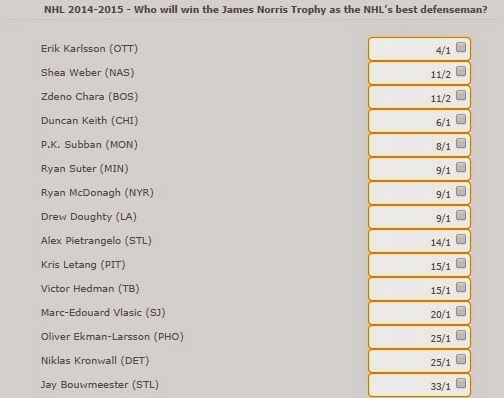 Keith is the defending Norris winner at 6/1 and should have great numbers again playing for the Blackhawks - might be worth a look if . There are some players on this list with great value such as Ryan Suter who logs plenty of ice time (2nd most ever in a single season last year) and puts up the points. Drew Doughty was considered the best d-man in the game during the playoffs this spring and if he can keep that momentum going he could cash you in at a smooth 9/1. Perhaps the best value picks are Alex Pietrangelo and Victor Hedman at 14/1 and 15/1 respectively. Both had career years last season and should only continue to get better. They could both put up 60+ points this season and develop into NHL stars. If you want to make some money, there's your two sleepers. 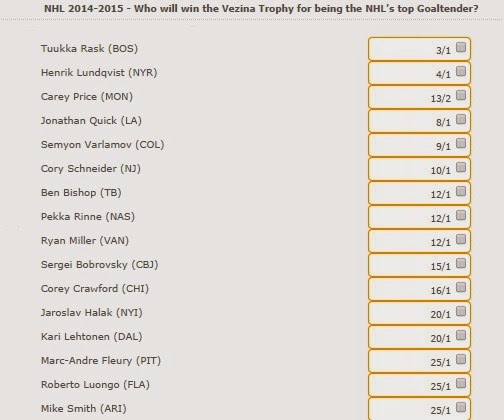 Predicting the Vezina is always difficult as goalies are the most unpredictable in a season. There's been five different winners in the past five years including this year's top two favourites, Tuukka Rask and Henrik Lundqvist. It's easy to say if a guy can stay healthy he has a shot and most of these goalies have Vezina-worthy seasons in them if they can keep their groins from pulling. Price has been very consistent and deserved a nomination last year with 2.32 GAA and .927 SV%. He continues to get better, but the big question is did the Habs get better this year to support his stats? If you like to pick keepers on good defensive teams you'll like Schneider and Crawford at 10/1 and 16/1 respectively, where as you might want to lay off guy's who are going to be seeing a lot of rubber and potentially more goals this season such as Luongo, Varlamov, Lehtonen and Fleury. We really like Jaroslav Halak at 20/1 as he's got a couple things going for him before the season even starts. Low expectations on a much-improved Islanders team will have people buzzing about him if he can put up those great numbers he's done in the past. Sidney Crosby is the safe bet as the world's best player, but at 7/4 you might want to have more fun and be risky. At 6/1, Stamkos is missing this trophy on his shelf and leading the Lightning to the playoffs could earn him plenty of praise. The same goes for Tavares who at 8/1 should garner a lot of MVP attention if the Isles march into the playoffs like they did when he was nominated in 2013. Ovechkin (12/1), Malkin (15/1) and Perry (20/1) were the three previous winners before Crosby and have great odds to contend if you like repeats. It'd be smart to avoid the goalies as they have to record setting seasons to win this award and stay away from Karlsson as he'd need Bobby Orr numbers to take home the Hart. Good sleeper odds on Jamie Benn at 35/1 get us excited to throw a ten down on him and see if he can build off his career year last season. The top five guys to lead the league are as expected, but the odds are surprising. 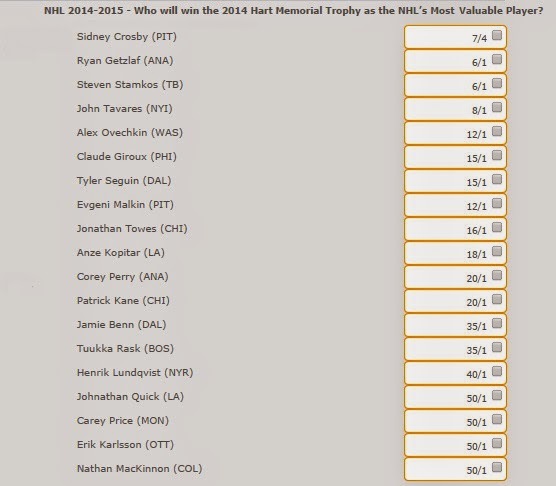 1/1 for Crosby probably won't get much play, where as Tavares and Malkin at 10/1 have to raise some eyebrows. Malkin's a two-time winner who's battled injuries of late, and Tavares is emerging as a superstar who was in the hunt last season before his injury at the Olympics. Nothing in sports is guaranteed, but when you have a kid who finished in the top-five in NHL scoring at 21 entering a better situation the following season, it’s reasonable to think he has a shot at the top spot. 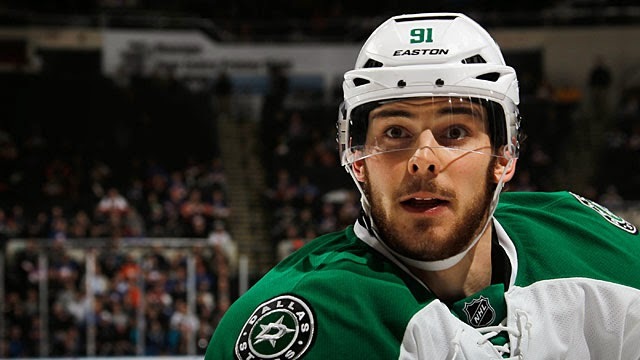 Seguin shot a puck through Bruins fans hearts last season - 37 times to be exact - and he could be on the verge of greatness if he builds off his recent career year. I like SUbban at 8/1. Best d-man in the league! Kuznetsov is my rookie of the year. Drafted him in every pool so far. Your own stock constrict is actually counting on the number associated with device which it is.